Montana Wounded Warriors brought five veterans to the Dillon area to hunt deer and elk. Over the last five years, this has been one of our most enjoyable trips we have been able to provide our wounded vets. We usually stay at the River Front house, but as that was not available, Todd and Lisa Tash offered their home to us and went and stayed with other family members for the weekend. We cannot thank Todd and Lisa enough for their hospitality and generosity. When they say my house is your house, they really mean it. David and Shelly Schuett once again opened their land for our warriors to hunt on. Their son Blade was our guide, and did an awesome job getting our veterans into the elk. Most of our vets on this trip had never shot an elk before, but by the time the trip was over they could all say they were successful elk hunters. Late Friday afternoon, the first day of the hunt, Nathan Pross of Columbia Falls started the weekend by taking his first bull elk. I think he’s still smiling!! The next morning Preston Ripplinger was able to follow suit and take his first elk, which was another bull. That afternoon Reo Phillips of Trout Creek, a veteran who served in Panama as well as Iraq, was the next to fill his freezer with a beautiful cow elk. Saturday evening we went into Dillon and had a wonderful dinner at the Blacktail Station and talked about how successful the had been thus far. While the rest of the town celebrated Halloween, our vets went back to the Tash house and shared stories about their experiences in combat and bonds were formed. Sunday morning started slow, but Bronson White was able to harvest a nice cow elk of his own with a great shot of over 400 yards. After lunch we went back out and Bronson was able to connect on a white tail doe while Preston and Jared harvested mule deer bucks. The trip came to a successful finale when late Sunday afternoon Jared Perkins shot a nice bull, his first elk ever. Montana Wounded Warriors would like to thank the Schuett and Tash families for their continued generosity in supporting our organization. We would also like to thank Paul Lemay of L&S Meat processing in Dell, MT for donating his services in processing Preston’s elk. We needed to have it cut up in a short time frame, and not only did they get it done, but they also processed it at no charge to our organization. Thanks again Paul! The Schuett Ranch welcomed us back a second time this year for some more deer and elk hunting. Again we had five Wounded Warriors join us for this hunt. Our guide, Blade Schuett, was ready to go Friday afternoon and took Deondrai Ramsey out spotting some elk for him. They were able to get their sights on a cow elk and Deondrai was able to knock her down with one shot. Saturday morning had a twist, as producers for the show Grateful Nation asked to film our men as they harvested their elk. They were there for the duration of the weekend filming for a show to be broadcast this summer. (no pressure!) That morning Dylan Porter was the first to knock down a bull elk. It was quite an adventure as the bull was not going down without a fight, but in the end Dylan won. Saturday afternoon we set out once again and Kelly Niesken was the next one in line for a nice bull elk. 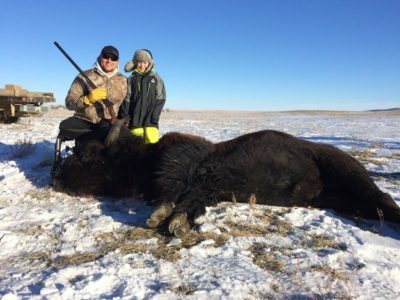 He was able to stalk one with great success and was thrilled to harvest his first bull. Saturday night we celebrated with a wonderful meal at a local restaurant in Dillon. Sunday morning, Blade took Kyle Seaborn out to look for an elk. Again, a bull was spotted, and again he was not going down without a fight, but Kyle was able to make the kill. Meanwhile, at the Tash Ranch, the others were looking to get some deer meat and by this time they had taken two bucks and a doe. Sunday afternoon the elk hunting was a little slow after all the weekend excitement, but we still held out hope that David Weidner would be able to tag out Monday morning so that all of our vets could fill an elk tag. Monday morning was our last opportunity to hunt, and our last elk hunter, David, was up for the task. This was the first time David had ever hunted, and he put a beautiful shot on a cow elk. Five for five! When we got back to camp, there were two more deer harvested as well – a very successful hunt! Thanks again to the Schuett and the Tash families for inviting us back. We are truly blessed by your generosity. This was our fourth year that Montana Wounded Warriors traveled to Twin Bridges and hunted the Trails End Ranch from November 17-20, 2016. Our Montana Wounded Warriors (Dustin Brawley, Rick Lamach, Brandon LaRocque, John Arnold, Kevin Chasson, Josh Deering, Brian Canich and Jon Crowe) all met up Thursday evening just south of Twin Bridges at the Big Hole C4 Lodge for some quality chat, camaraderie, and plenty of tall tales. The next morning we met up with Casey Cox and his helpers for breakfast in Twin Bridges. We then went on to the Trails End Ranch to shoot some rounds and confirm our zero. Then we headed to the river bottoms to thin out the whitetail population some. Over the next two days they harvested 9 nice whitetail bucks and 30 does. This Ranch is absolutely beautiful and managed in a stewardship manner to produce excellent wildlife opportunities. We’re very grateful for Mr. Kennedy to allow us to access his land and provide this wonderful healing atmosphere. Hanging out with Casey and the boys was a great time as always, and they all did an awesome job of helping our warriors out around the ranch. We had a wonderful time and would like to thank the owners of the Trails End Ranch and their staff for the opportunity to hunt their property. We would also like to thank Dave and Cindy Ashcraft and their two daughters of the Big Hole C4 Lodge for providing excellent accommodations and cooking two great home cooked ranch style meals! The hunt was completed Saturday night, and Sunday morning we headed over to Sanborn’s Fish Kreek Ranch Pheasant Preserve. Hunter and helper Alex Betz and his puppy Max, who was donated to Montana Wounded Warriors, helped round up some birds and round up the weekend. A great time was had by all! The N Bar Ranch, located in Grass Range, MT and owned by the Wilks Brothers, invited us back this year in full force. Our first hunt involved Patrick Cling, Grant Erickson and Mike Riggleman. What a great hunt! Both Patrick and Mike were able to harvest two cow elk and Grant took one down. The weather was unusually warm so rather than the usual way of doing things, Mike Sedgwick, the ranch manager and guide extraordinaire, skinned and quartered the elk right there. A meat processors dream! Thanks so much for the great hospitality, friendship and professionalism from Mike and Mary Beth Sedgwick, Dale Click, and the whole Wilkes Family. What a way to spend Veterans Day. We had a blast, and the wonderful meat harvested will feed our families well. Much appreciated! The second segment of our hunt at the N Bar had Montana Wounded Warriors Luke Thomasson, Kevin Chasson and Travis Norby chasing the elk. On the first evening Luke and Kevin got into the elk and Kevin was fortunate enough to harvest the first elk of the trip. When everyone met back at camp that evening for dinner our vets got a taste of N Bar hospitality. Ranch manager Mike Sedgwick’s wife, Mary Beth, came over to the lodge and set up a wonderful dinner for all of us. It was great for our veterans to have the opportunity to relax and get to know the Sedgwicks after a long day of travel and a successful first night’s hunt. The next morning had our hunters into the elk early. Both Luke and Travis were able to shoot an elk during the morning hunt. Mike showed off his skills as a meat cutter able to quarter up an elk and have it ready to hang in the cooler in less than ten minutes. We met Travis and his guides at the cooler and then headed back for lunch. That evening both Kevin and Luke were able to take their second cow elk as the second day of hunting came to a successful close. Another night of great food and conversation provided by our great hosts, including plans for the next day’s hunt and the hope that Travis would get a second cow. Travis didn’t disappoint us as early the next morning we got the call that he had filled his second tag. We cannot thank the Wilks’ and their awesome staff enough for the wonderful opportunity they provide for our wounded veterans. The accommodations and food were outstanding, the knowledgeable and talented staff show our vets great respect and do a fantastic job of providing them with a top notch experience. 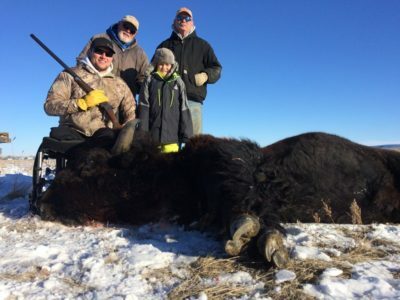 The owners and staff of the N-Bar Ranch welcomed us a third time with hunters Chuck Cloud, Chris Grudzinski, Clint Mainwaring and member Bob Lilienthal to their property. As in the past, the hunting was excellent and the lodging, meals and hospitality were second to none. All three of the wounded warriors were able to harvest elk, with some of them getting their first elk ever, an incredible experience. 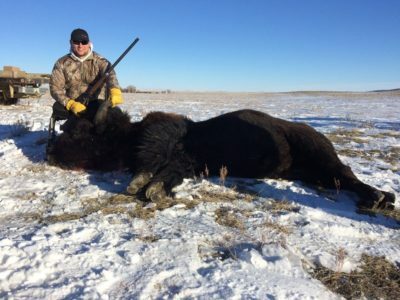 While the elk were pretty elusive, and hunting involved numerous miles on the trail, the excellent guiding skills of Ranch Managers Mike Sedgewick and guides Dale and Shawn ensured hard work paid off. 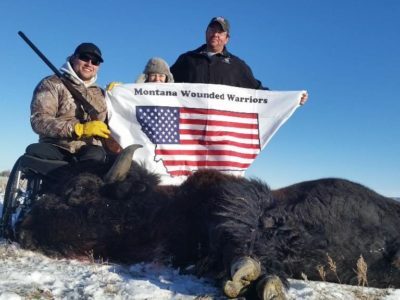 The Montana Wounded Warriors would sincerely like to thank Mike Sedgewick and his wife Mary Beth for another wonderful hunt, truly appreciating their kindness, professionalism and hospitality. Also, none of this would be possible without the generosity of the Wilks Brothers in allowing us to hunt their ranch. Montana Wounded Warriors had its most successful year yet harvesting mule deer, and this year’s hunt in Fort Peck was a big part of that. We were scheduled to take six wounded warriors on our trip, and unfortunately Chuck Cloud hit a deer with his vehicle before ever getting a chance to hunt. Thankfully Chuck was unhurt, but his vehicle was unable to make the trip to Fort Peck. Those who joined us were Jared Fleury, Chuck Williams, Brandon Olsen, Rob Turner and Chris Pyette. Once again the staff at the Fort Peck Hotel did a great job of putting our wounded vets on awesome deer. The weather was a little warm but the deer were moving and all five of our wounded vets filled their tags. Just as important as filling their tags is the camaraderie after a long day of hunting when the Wounded Warriors sit around the dinner table telling stories of that days hunt or comparing war stories. As a wounded warrior myself, I can attest that talking about our experiences to those veterans who truly understand really helps in the healing. We shared many laughs during the 5 day hunt and a returning veteran to our hunt, Brandon, seemed to gel the entire group together. He put in many miles looking for the trophy deer of a life time. The outfitter extended his hunt an extra day and a half to make sure he went home with a trophy deer. He as well as the others all had a great time. Thank you to the guides and staff to make this such a special hunt. Channel Outfitters of Bigfork, MT welcomed wounded warrior hunters Chad Wigley and Roger Henschel to a guided mule deer hunt in November, also accompanied by board member Bob Lilienthal. Guides Lindsay Channel and Aaron Manuel had thousands of acres of private land to hunt, but the unprecedented rains made access to much of the areas unreachable. Due to the diligence of the guides, and knowledge of the area, both Chad and Roger were able to harvest very nice bucks on the same day, Roger in the morning and Chad in the evening. Both hunters were very complimentary of the quality of hunting and the work of both Lindsay and Aaron. Montana Wounded Warriors would sincerely like to thank Channel Outfitters and crew for their great hospitality as well as a great hunting experience. Montana Wounded Warriors was invited to return and hunt for whitetail and mule deer on the Miller Ranch for the second year. As if it wasn’t an honor to be allowed to hunt for antelope, now Mark and Mary have opened their ranch to allow us to park a camper and hunt for deer. Two great warriors, Clint Mainwaring and Mike Kuntz, were invited for this great opportunity. We had the chance to throw back some cold ones and joke with one another to prepare for the first hunt early in the morning. The first morning tested Mike as the whitetails along the river were very allusive and skittish to the first sight of any hunters. Mike was a good shot, but not too many hunters could have shot in the time the whitetails presented themselves. We changed gears and took Mike to the mule deer area and that’s when the fun began. There were several mule deer bucks for Mike to choose from but the trouble was getting them to be clear for a shot from the many other deer bunched together. Several hours of chasing and stalking the deer led to them returning to the very spot we started hunting them. Mike got the shot at dusk and hit his deer in just enough light to find him lying not too far from where he shot him. We retreated to the camper for a great dinner and hours of laughing and teasing one another. The next morning proved much like the first. We hunted the whitetail and just could not get enough time to get a shot off before they ran into thick cover. After several attempts and a few miles of kicking through thick brush, we only saw glimpses of the deer as they eluded us. We decided to take Clint to the mule deer country that Mike took his buck on. We were driving to the field from the night before where we had seen all the mule deer just beyond a big hay stack. Clint wanted to sneak to the hay stack and try from there at the deer. Clint did a perfect stalk undetected to the hay stack and climbed up to the third level of the round bails. He just missed his first shot and the deer ran for safety and stopped at what they thought was a comfortable distance. Clint took a beautiful shot at over 600 yards and dropped the buck dead in his tracks. It was an amazing shot and impressive to see it firsthand. Clint did a great job and after tagging the deer, he informed us he wanted to donate the meat to a veteran that needed it. There was enough light in the day as we were returning to camp to pack up and head home when a nice whitetail buck came out of the thick brush into the field. Chris Grudzinski, our host and a wounded warrior himself, seized the opportunity and filled his tag as well. We ended the trip on a high note. All the warriors did great and we had a lot of fun together. It was a great trip and we cannot thank the Miller Ranch enough for allowing us to camp there and hunt their land. 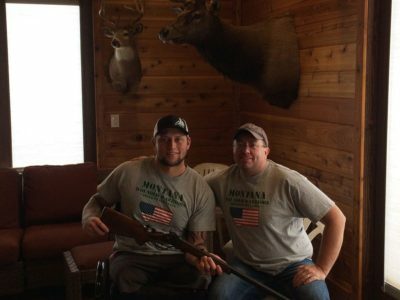 As the 2016 Montana hunting season kicked off , I found himself moving into a new and exciting role with Montana Wounded Warriors. I transitioned from a wounded vet that has been fortunate enough to be able to go on these trips that the program has worked so hard to establish for us vets to leading a hunt of my own. The program has been so helpful for me in my recovery and transition back into the civilian life. I’ve met new life long friends and mentors from this program. Recognizing this I felt that I wanted to do more and be more involved and hoped to help other vets as much as the program has helped me. I got that chance this year, leading 6 vets in Alzada with Trophies Plus Outfitters for opening weekend of general deer season. It was a great success with 5 out of the 6 tagging out. I’m fully confident that our sixth hunter would have tagged out if he had not had a family emergency that forced him to leave early. It was an amazing trip full of great people, especially the entire staff at Trophies Plus Outfitters, making all the vets feel welcome and cherished. It was full of banter and side splitting laughter. I couldn’t have felt more proud to be able to give back and help out with Montana Wounded Warriors. I look forward to great things to come and furthering my efforts with this fantastic program. This was the third annual hunt on the Johnson and Ballard Ranch. We started the hunt off with two veterans that also served with Jim Ballard’s son. Art Hazen and John Bennett started the hunt off in search for buffalo. They each made great shots, but John made sure that he gave his friend lots of heckling when it took him two shots to bring down his buffalo. Both John and Art were in the same unit when John was shot in the back by a sniper; Art was by his side then and to this day they are still best of friends. After they each got a buffalo we moved over to the Ballard Ranch. Jim and his son Ross love taking the Montana Wounded Warriors out on their property in search of deer and elk. Jim Ballard said it best: Having MTWW’s out for the weekend is like having his son Alan back. It brings great happiness to the Ballard family as they are able to reminisce about their son who was also an OIF vet. Both Art and John hunted the Ballard ranch. John got a nice mule deer while Art got a monster whitetail. It was another successful hunt. We look forward to next year.